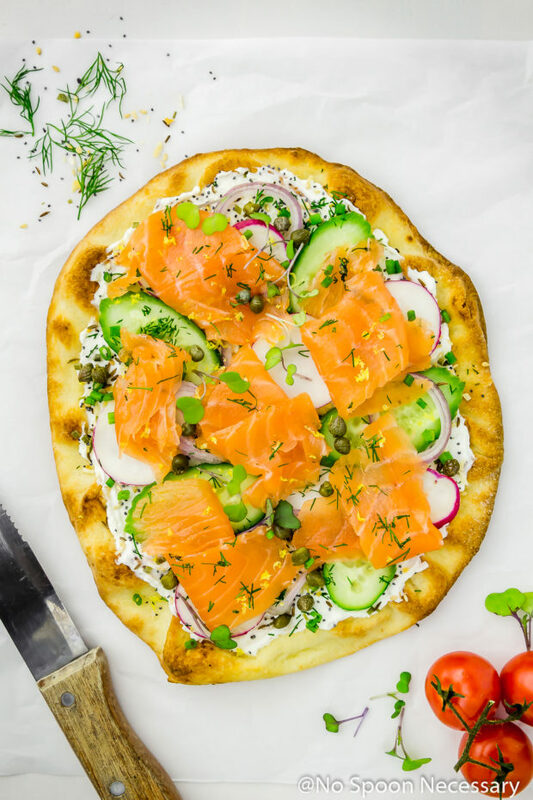 Pillowy soft naan bread slathered with everything bagel spiced cream cheese, and generously topped with crisp spring vegetables, fresh herbs and cured (or smoked) salmon. 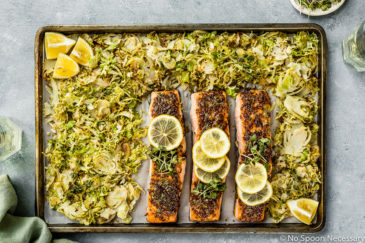 This Spring Salmon Pizza is fast, flavorful, and absolutely fabulous! Well, hey there friends! Happy Thursday! Today we celebrate the imminent weekend with PIZZA!! Because, really!? Shouldn’t we be celebrating EVERY day with pizza? 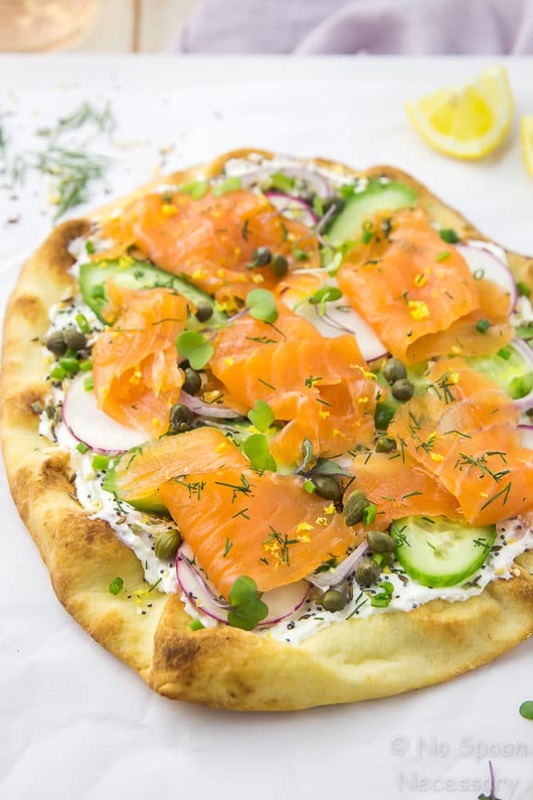 AKA naan pizza loaded with ALL the spring things, and salmon for delicious good measure. 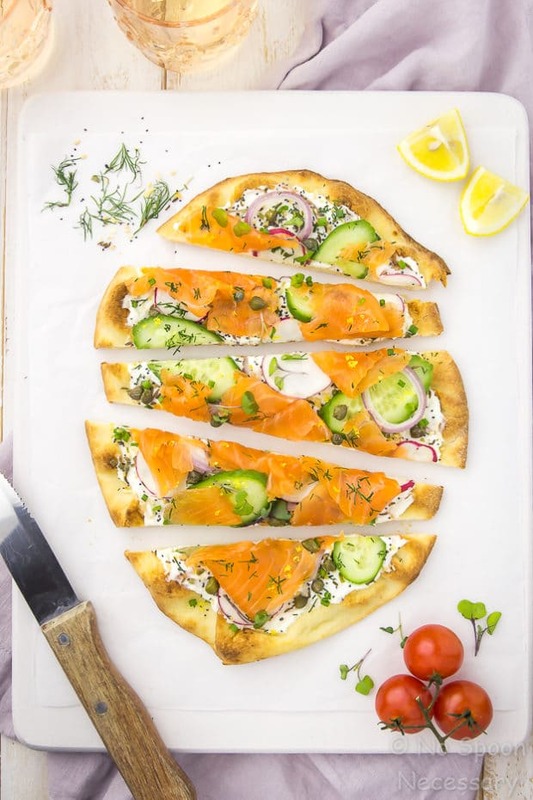 Warm, toasty naan bread slathered with rich cream cheese, sprinkled with seedy, flavor-packed everything bagel spice, and lovingly topped with luxurious, delicate, thin slices of salmon, fresh herbs and cool, crisp spring vegetables. This pizza is a sensational spring soirée for your taste buds, you guys. The toppings are limitless (think avocado, tomatoes, caviar if your fancy) and the flavor is amazing. But, if all that tasty pleasure wasn’t enough, I’m also declaring this pizza HEALTHY. Because with all those cool, crunchy veggies and that protein packed salmon, how could this NOT be health food? Well, to that I say, cheese and carbs ARE a part of the food pyramid. And balance is HEALTHY. Now that we have covered all the good stuff, I feel like we should back it up real quick. Don’t worry I’m not talking about twerking or anything crazy like that. I’m talking about legit, beeeeep-beeeeep, backing it up. As in, a post rewind. 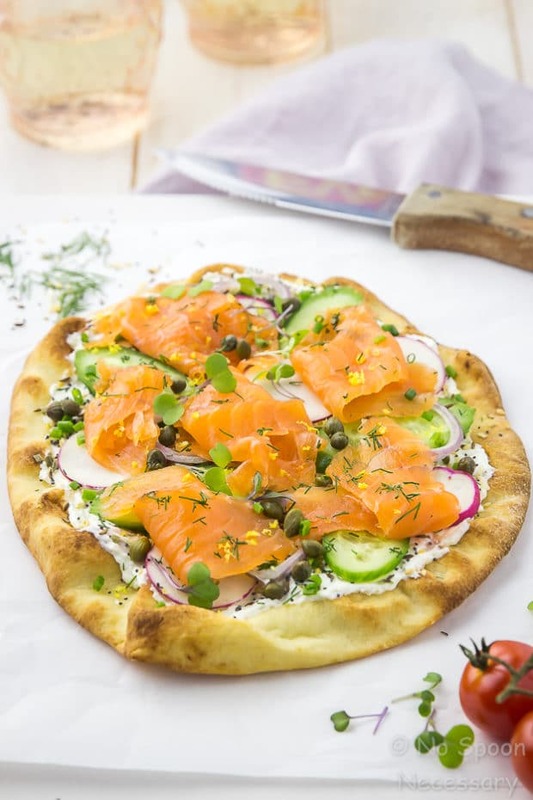 Mostly, because today’s crazy delicious recipe for salmon and cream cheese pizza with everything bagel seasoning utilizes the homemade cured salmon (aka gravlax) from Monday’s post. Aaaaaand, a few people commented that they loved smoked salmon on that post. While your love of smoked salmon IS all sorts of awesome, because I love smoked salmon too(!! ), the gravlax from Monday is NOT the same thing as smoked salmon. 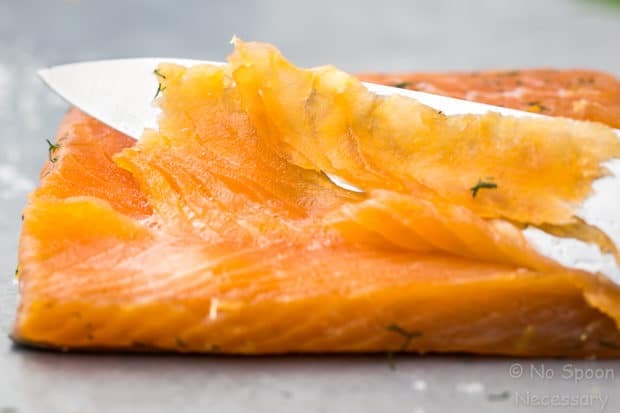 SO, I thought it might be helpful to drop a little 411 and share the difference between cured salmon and smoked salmon. 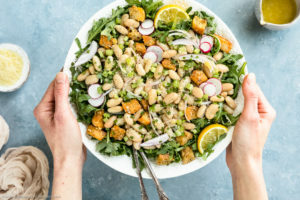 If you could care less and aren’t in the mood to get your culinary learn on, feel free to scroll down to the recipe. I promise, I won’t judge. What is the difference between smoked salmon and cured salmon? Gravlax is a cured, UN-SMOKED salmon. There are 3 basic ingredients to the gravlax cure: salt, sugar and dill. There are TWO types of smoked salmon, cold and hot. Cold smoked salmon is cured in salt only. Then, it is rinsed and cold smoked… meaning, the smoke flavors the fish, but it does NOT cook the fish. Hot smoked salmon is cured in only salt as well. But, then it is essentially barbequed… meaning it gets cooked ALL the way through until it is flakey. 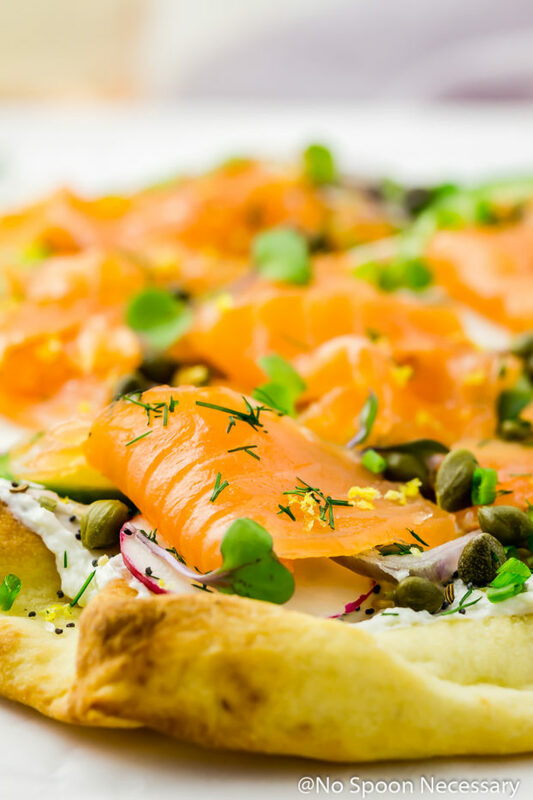 That being said, on today’s pizza you can ABSOLUTELY use any kind of salmon – gravlax, cold smoked, hot smoked, poached, grilled. WHATEVER your little heart desires. Do you, people. 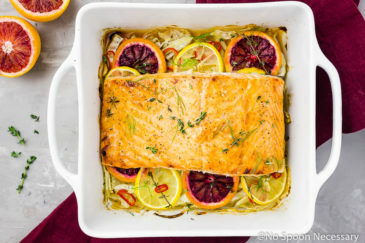 The measurement of salmon in the recipe below is approximate. Use as much, or as little as you would like. This pizza is highly customizable, and the toppings are limitless. Therefore in the recipe below, I didn’t include measurements, just mere suggestions. 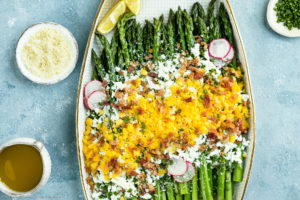 Add whatever produce is fresh, or whatever veggies you like and have on hand. 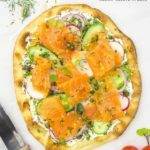 I used homemade gravlax to make this pizza (which is SO easy to make at home)!! 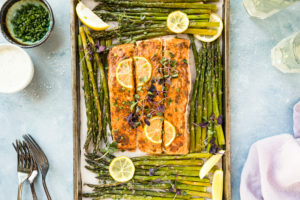 However, you can substitute smoked, poached, grilled, ANY type of salmon you would like for the cured salmon in this recipe. You can substitute flat breads for the naan, or you can use a ball of pizza dough to make one large pizza instead of 2 small pizzas. Just make sure you bake the pizza dough before assembling. Give your pizza the fresh and fabulous treatment with this Loaded Spring Salmon Pizza. Until next week friends, cheers – to killing it on Thursday with salmon on PIZZA. Because why should Friday have all the fun? Preheat oven to 400 degrees F. Line a baking sheet with aluminum foil and spray with nonstick cooking spray for easy clean up. While the oven is preheating, make the everything bagel flavored cream cheese*: In a small bowl mix together the cream cheese and all the seasonings. If a looser cream cheese consistency is desired, stir in milk or cream, one tablespoon at a time until desired consistency is achieved. To Assemble: Remove naan from the oven and spread heaping ¼ cup (or more to taste) of the flavored cream cheese on top. 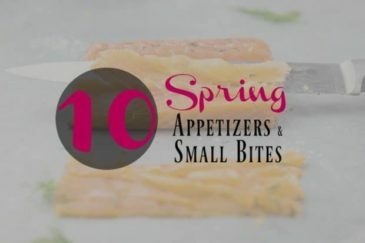 Scatter the salmon on top of the cream cheese and top with desired garnishes. 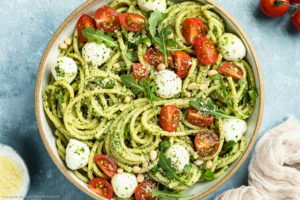 Sprinkle with fresh herbs and serve immediately. 1. The measurement of salmon in the recipe is approximate. Use as much, or as little as you would like. 2. This pizza is highly customizable, and the toppings are limitless. Therefore in the recipe, I didn't include measurements, just mere suggestions. 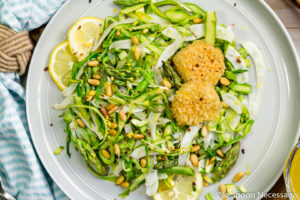 Add whatever produce is fresh, or whatever veggies you like and have on hand. 3. You can substitute smoked, poached, grilled, ANY type of salmon you would like for the cured salmon in this recipe. 4. You can substitute flat breads for the naan, or you can use a ball of pizza dough to make one large pizza instead of 2 small pizzas. Just make sure you bake the pizza dough before assembling. This pizza looks beautiful,the colors just scream spring! Dang I sure missed drooling over your delicious concoctions last week! 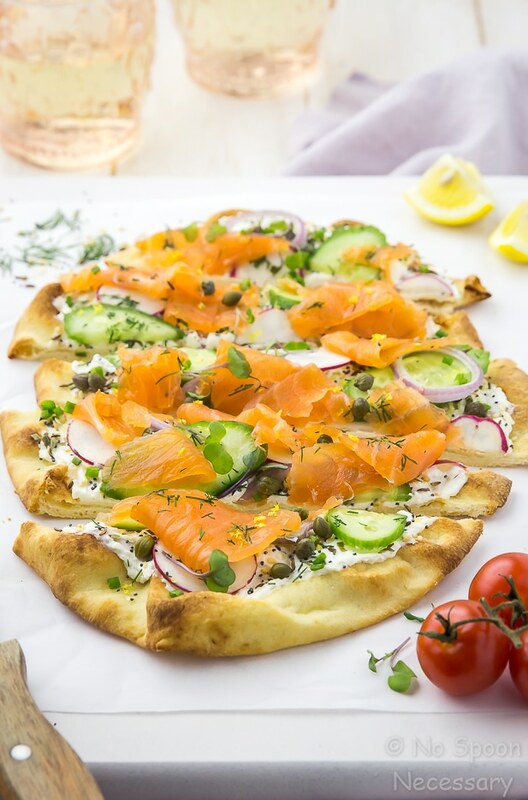 My daughter and I have a Friday Pizza night but skipped it this past week as we were outta town so our plan is to enjoy 2x the pizza this week and this naan pizza with smoked salmon would sure bring some elegance to our pizza night fete! You do make the most amazing pizzas! Smoked, cured or BBQ….salmon is amazing. I still haven’t tried cured salmon, but one day I will. Hope your weekend was amazing! Hope you are having a great weekend Cheyanne! This pizza looks amazing! 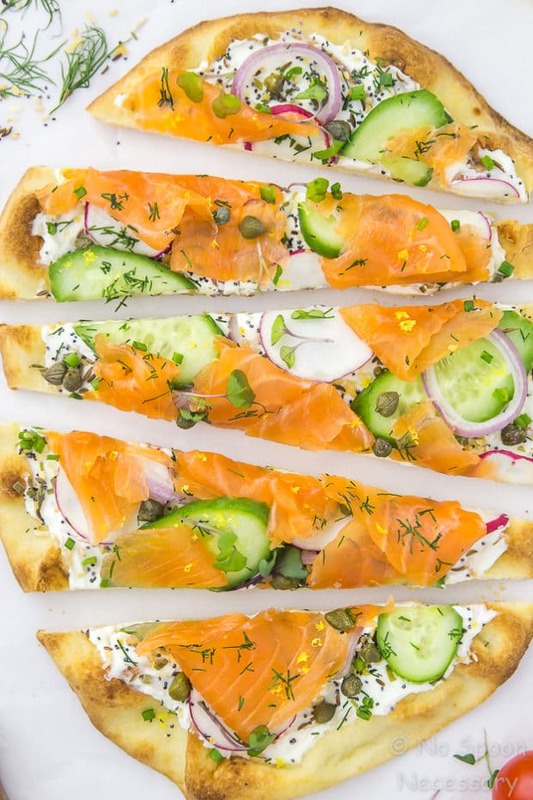 Need to make your homemade cured salmon and the pizza! Great photos as always! 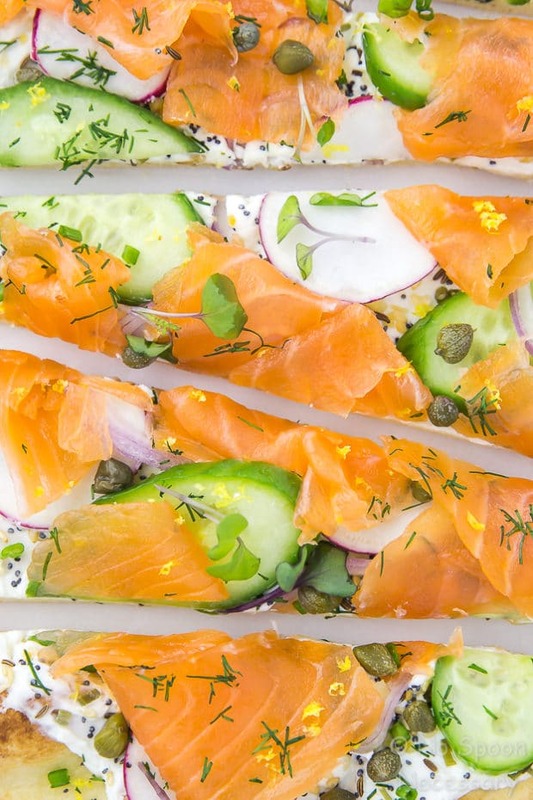 This is such an amazing take on smoked salmon and cream cheese! 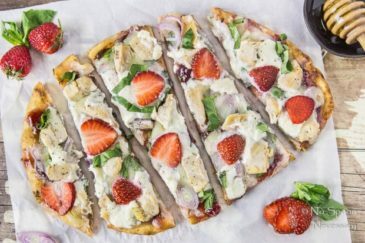 You’ve made such a beautiful pizza with all those spring veggies and that everything bagel cream cheese is such a great idea! 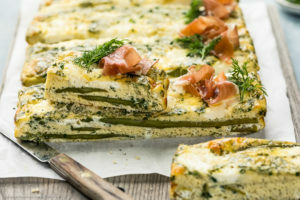 This would be great for brunch, appetizers, or just to eat whenever. Have a wonderful weekend Cheyanne!